It’s been a long cold winter and you’ve noticed you’ve gained a few inches, all in the wrong places. When the days are warm and sunny you’re out there running daily, hitting the gym and going to extremes trying to compensate for those lazy days where you didn’t feel like braving the cold. Even a trip to the gym in below freezing temperatures keeps you indoors and unfortunately, overdoing it to compensate could be (and probably is) doing more harm than good. Here is some of what you need to know about the importance of periods of rest between workouts – strenuous exercise of any kind. For those who still don’t believe Werewolf Muscle Training works, here is more support of my theory that increased frequency combined with stopping short of fatigue, produces equal if not better results that training a muscle once a week for an hour, with a ton of volume, going to failure on most sets. The central nervous system is extremely important for performance, and should be stimulated aggressively and frequently, but should not often be fatigued. This also helps explain why you can train muscles when they’re sore… it works just as long as the CNS has recovered. In this video you will find Christian Thibaudeau from T-Nation. He is way stronger than you or I, and he is just about as ripped as I could ever hope to be. A true inspiration. While navigating a fitness website or browsing through a fitness supplement store, you may notice various muscle building supplements. You may wonder whether any of these 10,000 products really work to build quality muscles and enhance strength, or will they merely flush into the toilet? The answer is both yes and no. The answer is ‘No’ for people who do not have patience and want fast results while they opt for an unhealthy approach. However, the answer is ‘Yes’ for people who go for the right kind of supplement, use proper exercises and diet, and wait for weeks or sometimes months to see the result. Fortunately, you have a couple of good supplements which guarantee good results. These supplements for fast muscle growth can deliver the desired result within a short span of time. These include Whey Protein, Nitric Oxide and Creatine. Which happens to be the right choice for you? I recommend training with bands specifically in the Werewolf Training routines, but also in any routine you might currently be following. Recent studies investigating the effects of training the bench press with added bands and chains, have confirmed that strength and power increased faster by using bands and chains than by using free weights alone. In this 13 week study on the effects of training with elastic tension on the bench press, 11 men in their early 20s started with a 1 rep max (RM) baseline strength test. Now you can download the Werewolf Training for Strength Gains workout routines in Excel spreadsheet format. You can use these files to print out the routine and take it to the gym on a clipboard, keep track of your progress on the computer, or both. The routine with 2 days of rest on the weekend and with rest every 4th and 7th days are both there. Click this link to go to the download section of the post so you can download your spreadsheets! Other workout logs are coming shortly. I’ll try to whip up some workout logs for the full body routine, 3×5, and some of the other routines too, but right now I’m working on the Project Swole redesign so don’t hold your breath. This training routine is designed for you to gain strength. That’s it. 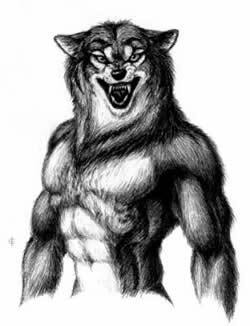 So you have already been through two or three Werewolf Training for Muscle Gain cycles. You gained 5-10 pounds of muscle in that time and you got a little stronger. You are psyched about your progress but you’re a little bored with the program. It is time to change up your training a little bit, but you know you can’t jump right into a strict fat loss phase, or you risk losing most of your new muscle. What to do? What to do?